When you have a problem, it seems like everyone, from your coworkers to your aunt to the person in the elevator with you, has advice for you to follow. Combine that with all the information on the internet, and you may be overwhelmed with advice about your roofing work. Unfortunately, this advice is often contradictory and rarely comes from experts. Because of this, there are several roofing myths floating around that homeowners often believe. If you have questions about roofing repair or replacement, it’s still best to go to a trusted roofing contractor for answers. Here are 5 of the most persistent roofing myths. DIY projects are popular because, in theory, they’re more affordable. It’s also not a bad ego boost to feel like you can repair your roof all on your own. Unfortunately, roofing work often involves unforeseen risks and damages that even a handy homeowner might not be prepared to handle. It’s more than just replacing shingles. Do you know how to repair a leak for the long term and how to avoid them in the future? Do you know what to do about roof rot or ice dams? DIY roofing projects can also be risky because if the homeowner makes any mistakes in the repair, they’ll have to cover the damage. If you hire a roofing contractor, any damage from accidents is covered on their end, and they’ll be better able to spot and resolve complicated roofing problems. Your roof gutters protect your roof from water damage that could lead to leaks or roof rot. If the gutters are clogged or leaking, this could spell disaster for your roof. Roof gutter maintenance is often neglected in DIY roof maintenance because it’s seen as a less pressing problem than roofing maintenance, but the two issues go hand-in-hand. If you let your gutter maintenance fall by the wayside, it will cause more problems for you to deal with in roof maintenance. Many homeowners think they know what a bad roof looks like: curled or broken shingles, cracks of light in the attic, sagging, discolored sections of the roof. These are all important signs, to be sure, but just because you don’t notice any of these things doesn’t mean that the the roof is in perfect shape. A roofing contractor should perform a thorough roof inspection to ensure that there are no hidden problems that could be eating away at the lifespan of your roof. Much like only going to the dentist when you have a cavity or only going to the doctor when you’re obviously sick can be damaging to your health, waiting for disaster to strike before you hire a roof inspection can be damaging to your roof’s health. You should certainly have your roof inspected after a bad storm, but the National Roofing Contractors Association (NRCA) also recommends having it inspected twice a year, during spring or fall. These regular inspections can help you to catch roofing problems early and repair them before too much damage is caused, and that could cost you less money in the end. It matters who you hire to do your roof repair or replacement. How much experience does your roofing contractor have? In your area? How much experience do they have with your particular problem? What do their customers say about them? It might be tempting to hire the cheapest roofing contractor, but that could cost you more in the long run when you have to have roof repair performed more frequently. Do your research to ensure you’re hiring a roofing contractor you can trust to do a thorough inspection and perform quality, lasting roof repairs. First Texas Roofing has an excellent reputation with our customers over our 15 years of experience in Keller, Texas and the surrounding areas. We’re experts when it comes to roof repair and replacement, and we can offer you reliable answers for any of your roofing questions. We won’t use high-pressure sales tactics to get your business, we’ll just let our reviews and quality of service speak for itself. Contact us today for a free quote. A little leak could lead to a big problem. Call your Fort Worth roofing company before it gets any worse. Sometimes, we can take our roof for granted. It’s just always there, protecting our homes from the weather and pests of the outdoors. It’s hard to imagine life without it. So when we first notice a tiny leak or faint watermarks in the ceiling, it might not seem like a big deal. It’s just something that will need to be fixed later. Life gets busy, and later gets pushed further and further back. Meanwhile, that little roofing problem? It’s growing. A little leak or a slight sag could be more dangerous than you realize, and it can lead to issues that could affect your entire home. In fact, if problems with your roof go untreated, it might eventually mean having to leave your home. Here are some of the most shocking dangers that could come from a damaged roof. Asbestos is a term used for six naturally occurring minerals composed of microscopic “fibrils.” Because asbestos is resistant to fire, chemical and thermal degradation, asbestos cement was a popular roofing material in the 20th century. The cement was used for shingles in the United States going as far back as the 1920s. However, today asbestos is known for something other than its resistance to chemicals: it is the “silent killer” of thousands of construction workers. It can take years and often decades for asbestos symptoms to manifest, and when they do, they can lead to serious illness like mesothelioma and lung cancer. If asbestos cement was used in the shingles of your roof, your family could be breathing it in right now. Unless the asbestos material is damaged, the use of asbestos cement in roofs is not necessarily dangerous. It’s only in the instance of damage that asbestos releases fibrils into the air and thus becomes a health hazard. However, this means that if asbestos is one of the materials that makes up your roof, you need to take extra care to ensure that it’s not damaged. It may be safer, in the long run, to replace the roof with a less harmful material. Have you ever looked up at your ceiling and noticed a patch of discoloration or a bulge? That’s likely water damage caused by a leak in the ceiling. The leak itself may be small, but the effects of water damage can be severe, especially if the water comes into contact with any electrical wiring, such as the room’s lighting or a ceiling fan. Electrical shortage in your home caused by water damage could leave your home without power until the problem is resolved. It’s also a dangerous fire hazard. It’s better to stop before things get to that point. If you have water damage, turn off all electricity in the area and call your electrician to examine the wiring. After that, call your local roofing company to fix or replace the leaky roof that caused the damage in the first place. A leak in the roof may cause a puddle to form on the floor of your home. Depending on the flooring material and the color of the floor, the puddle might not be immediately obvious, especially if you’re not expecting it in your home. The prospect of slipping and falling on the floor isn’t pleasant for anyone, but this can be especially dangerous if you have active children running through the house or anyone elderly living in the home. It can also be particularly dangerous for residents with impaired vision. If you notice a leak, call a roofing company immediately. Until the roof is fixed, place a bucket or something similar under the leak to collect water so that it won’t pool on the floor, and your family members will know to steer clear of it. This is another reason to take leaky roofs seriously. Water damage from a leaky roof could seep into the insulation of the home or the HVAC system, where the damp environment could cause mold and mildew to grow. Once mold grows, it spreads and filters through the vents of your home, where the whole family could breathe it in without realizing it. It can also attack the wood framing or ceiling tiles of your home. The most common mold you’ll find as a result of leaky roofs is black mold. Mold and mildew can pose serious health concerns, especially if you have an allergy or asthma. Mold can cause lung infections or obstructive lung disease. It is especially dangerous for young children, as it has been linked to acute idiopathic pulmonary hemorrhage in infants. If your mold issue becomes bad enough, you may be forced to evacuate the home while it is fumigated. That’s why it is important to stop a mold issue as soon as you notice it. Talk to a mold and mildew removal expert about the best way to remove the problem, and then talk to your Fort Worth roofing company about how to prevent it in the future. A bad roof can also affect the whole structural integrity of the home. Leaks can weaken the wood beams that hold up the home. Water damage, if untreated, could cause the ceiling to give way. Weakened structural integrity also makes the house more susceptible to storm damage like strong winds or fallen trees. One prevalent problem that could compromise the structure of your home is roof rot. Roof root is caused by excessive humidity and moisture in the attic without proper ventilation. Dry rot can affect the roof deck as well as the insulation of the home. Roof rot is often the underlying problem when your roof begins to leak. In the worst case scenario, roof rot could even cause the roof to collapse. That’s why a roof ventilation system is as important as ventilation for the rest of your home. Is the roof of your home healthy? Or are there small, almost unnoticeable problems that you’ve put off fixing? To prevent damaged roofs that may cause more insidious damage to your home, you should have a roof inspection at least once a year. Fortunately, if you need work done on your roof, First Texas Roofing provides affordably priced quality roof repair designed to LAST. 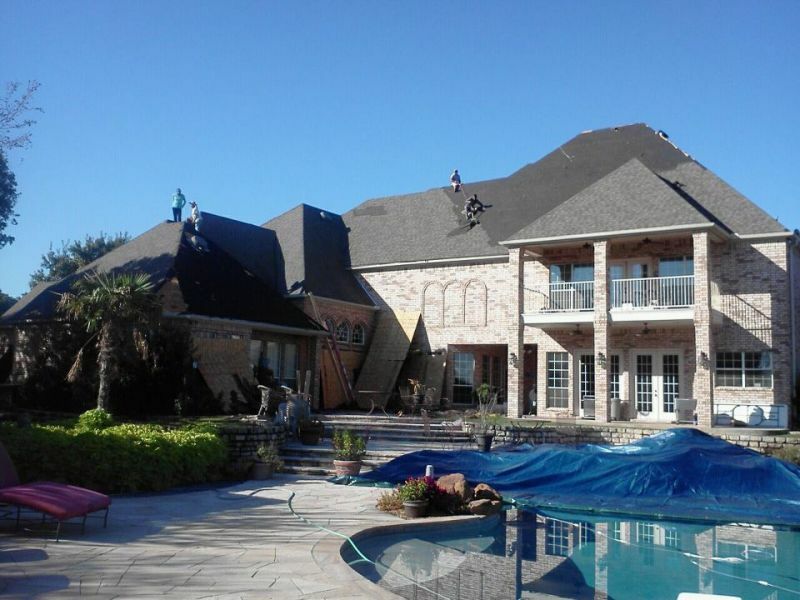 Even if your roof needs to be replaced completely, First Texas Roofing will ensure excellent service and durable product. We have nearly a decade of experience to vouch for us. Don’t let your small roofing problems cause huge dangers to yourself and your family. Contact First Texas Roofing today for a free, no-obligation consultation and estimate. Fort Worth summers can be rough, but do you know how rough they can be on your roof? Texas is famous for sweltering summers that only a native Texan could love (and even then, not always). The sun beats down relentlessly as temperatures swell to the 90s and even into the 100s. August may be over, but anyone who’s lived in Fort Worth for longer than a year knows that doesn’t mean that the heat is finished with us yet. Residents know how to take precautions for themselves: crank up the AC, break out the sunglasses, and use sunscreen if you’re going to be outside for long. But what precautions are you taking for your roof? The extremes of summer weather is often your roof’s worst enemy. It’s directly in the line of the sun’s most harmful UV rays, and, without protection, it can start to deteriorate. Hot, sunny weather isn’t the only thing to worry about in the summer. Your roof can also sustain water damage, tears, and leaks as a result of severe storms. Fortunately, there are measures you can take to protect your roof. Here are some of the dangers your roof can face in the summer and what you can do to protect it. Your roof may shield you from the heat and UV rays of the sun, but in doing so, it can take quite a beating. The extreme heat can erode the weatherproofing materials used to protect your roof and dry out roof tiles, making them obsolete. When the weather changes rapidly due to a storm, the roof can’t keep up and tiles may become loose. Additionally, changes in weather cause the roofing materials to expand and contract, so the more the weather changes, the more your drainage system can be pushed away from your roof. We have sunblock to protect our skin from the worst effects of the sun, and for roofs, there’s roof coating. A reflective roof coating will reflect the sun’s rays rather than absorbing them. It can last up to 10 years before it needs another coating, but especially in the hottest days of the year, it’s important to watch your roof for obvious signs of sun damage. Do you notice any faded discoloration? Any cracks or loose tiles? Summer storms are as brutal as the summer sun. They can take a toll on your roof, and so can the humidity that follows as a result. Humidity can weaken and erode the materials of your roof, making it more susceptible to those heavy hitters like hail and strong winds. You also have to worry about damage from nearby trees. There might not be much you can do to prevent a tree from falling on your roof if the storm is strong enough to knock it over, but you can cut away close branches that could scrape and puncture your roof in the midst of a storm. If your roof doesn’t have impact-resistant asphalt shingles, now may be the time to change that. They’re built to withstand heavy storms and even hail. Talk to a roofing professional about replacing the shingles on your roof, or repairing any damaged shingles. Before summer begins, your roof should be in top shape to best protect it from those severe summer storms. With storms comes rain, and water damage can be the greatest threat to your roof. Untreated water damage can lead to leaks, roof rot, and weakening of your home’s structural integrity. The important thing is to stop water damage before a leak occurs by watching carefully for signs. Do you notice any curling of your roof materials? Any crumbling cement? Are your vents in working order or are they clogged? You can also see water damage from inside your home by watching for any discoloration or bulges on the ceiling. Your roof’s best defense against water damage is its gutters. The drainage system is designed to collect all the water that falls on the roof during a storm and direct it away from the house. If your gutters are clogged or damaged, water will pool on your roof and weaken it. Clean your gutters regularly and if they need to be repaired, don’t hesitate to repair them. You should also call a roofing professional at the first sign of a leak to seal it up before it causes serious damage to your home. It’s not just the weather that your roof needs protection from–it’s people. Because of all the dangers it poses to your roof, summer is the prime time of year for roofing contractor fraud. Unfortunately, these con artists often appear after a natural disaster and take advantage of homeowners with damaged roofs. An alleged roofer may ask for a down payment before starting the work and never return to do the work after the payment is given. They may offer a “free roof inspection” and then cause extra damage to the roof, so that the insurance company will cover the repair cost. They may tell you about an extremely limited time offer to pressure you into signing a contract without looking elsewhere. Don’t be pressured, and trust your instincts. If something sounds too good to be true, that’s probably because it is. Do your research on any roofing contractor that approaches you, no matter how sweet their deal sounds. Get quotes from multiple companies and read reviews to make sure you’re getting the best quality for your money. After all, roofing repairs can be a hassle. You want to make sure that they’re done right in the first place. When searching for a legitimate, quality roofing company in Fort Worth, you want a company whose reputation speaks for itself. Search their ratings with the Better Business Bureau and see what their customers have to say about the quality of work they provide. You want a company who has nothing to hide because they’re proud of their service. First Texas Roofing has been in business for over 15 years and maintained a standard of excellence. Contact us today for a free, no-obligation estimate.